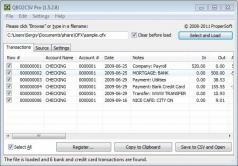 With the help of QBO2CSV you'll be able to easily load your QuickBooks transaction files and turn them into the more common CSV format in a few clicks! Compare spreadsheets with this tool. Convert multiple PDF files to RTF.